Buyers are ditching the sedan for small crossover utility vehicles (CUV) as their family car of choice. Millennials seem to love CUVs for some reason, and the Toyota RAV4 is a popular one, selling over 315,000 units last year in the US alone. New for the refreshed 2016 RAV4 is a hybrid powertrain option that adds electric motors and a battery pack to the standard 2.5-liter, four-cylinder motor. Usually, when I hear Toyota and hybrid mentioned in the same sentence, my mind automatically assumes it's going to be dull and boring, like a Prius or Camry Hybrid, but the RAV4 Hybrid is different. While the Prius is focused on delivering outstanding fuel economy, and the Camry Hybrid sits between the base and optional V6 for power, the RAV4 Hybrid relies on electrification to boost power output, improve fuel economy and help people forget about the previous generation's available V6. I was never a fan of how the RAV4 looked when it debuted in 2013, but the facelift gives it a sleeker front end. The new tail light pattern is the freshest styling take since Toyota's introduction of the Altezza (Lexus IS300 in North America) that subjected us to two decades of cheap aftermarket knockoffs for every car you could possibly imagine. Toyota didn't go too crazy on chrome trim on the RAV4 Hybrid Limited either – just the door handles and part of the side windows. I prefer the sportier and darker trim of the RAV4 SE, but it's not available as a hybrid. The RAV4 may have gotten a rhinoplasty and hybrid powertrain, but is it any good? To find out, I spent a week in a fully loaded 2016 Toyota RAV4 Hybrid all-wheel drive (AWD) Limited with a price tag of $34,510 (£31,985 for the similar Excel trim level with Toyota Safety Sense and sunroof, but not available in Australia) during a week of rainy Washington weather. Toyota lifts the hybrid powertrain from the RAV4's luxurious sibling, the Lexus NX300h. The RAV4 employs a 2.5-liter, four-cylinder gasoline engine and three motor generators (MG) – a generator / engine starter (MG1), front electric motor (MG2) and a rear electric motor (MGR). Total power output is 194 horsepower (hp), an 18 hp boost from the non-hybrid version while returning fuel economy ratings of 34 (miles per gallon) mpg in the city and 31 mpg on the highway. The non-hybrid RAV4 is rated at 22 and 29 mpg in the city and highway, respectively. The MGR is the main differentiator for the RAV4 and Camry hybrid power trains and the key to what makes it entertaining to drive. While the pure gasoline RAV4 AWD employs a physical drive shaft to drive the rear wheels, the hybrid uses the third MG solely to drive the rear wheels. It's a 67 horsepower (hp) MG that provides instant torque on command and gives the RAV4 Hybrid a rear-biased driving dynamic for plenty of smiles per hour. Toyota dubs the system AWD-i, for intelligence, which automatically powers the rear wheels when it detects slippage. Engage the sport mode button, and the throttle and steering become more responsive and precise for aggressive driving. I was able to push the RAV4 Hybrid Limited around The Ridge Motorsports Park's go-kart and off-road test courses during the Northwest Automotive Press Association (NWAPA) Mudfest 2016 event earlier this year and walked away smiling. Getting the tires to squeal around the go-kart track brought endless amusement, especially since the car is so economical at the same time. 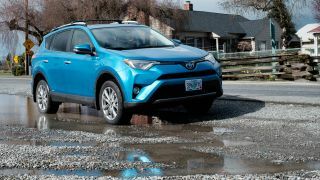 The go-kart track did reveal the RAV4 Hybrid's energy-saver tires as not having the best tread for spirited driving, but that's understandable because buyers will never hit a race track. The off-road course was even more fun than the go-kart track. I got the RAV4 Hybrid sideways in the dirt, with a feeling the rear end would whip around from oversteer at any moment, but the AWD-i system provided great control and entertainment – not something I expected from the Prius creator. Around town, I only saw an average 23.1 mpg at the end of the week, to my own fault no less. Always driving the car in sport mode and mashing the pedal like a testosterone-filled 16-year-old boy doesn't return good fuel economy, but it made me smile – and that's all that matters. But, it all goes downhill from there, unfortunately. The RAV4 Hybrid's powertrain is the highlight of the car, because things take a downward spiral when you step inside. Toyota makes gratuitous use of cheap, hard plastics all around. Hell, the RAV4's interior materials make the Hyundai Tucson and Kia Sportage seem like luxury vehicles that should compete with Lexus. Leather isn't available at all on the RAV4, regardless of trim and powertrain. SofTex synthetic leather standard on the Limited trim, which lacks the soft and suppleness of real leather. It's not all bad, SofTex is easier to maintain than real leather and less prone to cracking over time. However, synthetic leather is a material that should be used on lower trim levels like the SE or XLE, not the taste-of-luxury Limited. One spot Toyota didn't pinch pennies is the auto dimming rear view mirror. The RAV4 has a sleek frameless mirror that works like every other one, but adds a touch of class to the peanut-butter brown interior. Toyota's 7-inch Entune infotainment system has the same interface as it does in other Toyota's, like the Camry XSE. There's plenty of physical buttons and knobs that make accessing the home screen, apps and audio functions quick. Android Auto and Apple CarPlay are not supported, which would make Entune 100 times better. Instead of supporting the industry-standard smartphone-linking features, Toyota wants drivers to download a separate Entune app on iOS and Android smartphones for access to Pandora, online search, Yelp and others. Using the Entune app requires a separate user login and access to the accounts for the associated apps. I'm not fond of creating another login when Google and Apple let me use the account that owns my life via Android Auto or CarPlay. Native navigation is included with the 7-inch touchscreen, but the maps are plain and lack the detailed 3D building renderings you get with Apple or Google Maps. My problem with Toyota Entune is, if it's going to flat out refuse to support Android Auto and Apple CarPlay, at least make the user interface and maps worth it to use over the free solutions. Toyota's uninspired user interface, early-2000-era navigation maps and hindsight makes it hard to like Entune when Ford, General Motors, Honda, Hyundai, Kia, Volkswagen and practically everyone else supports Android Auto and Apple CarPlay. Toyota makes its Safety Sense P suite of driver assists standard on the RAV4 Hybrid Limited and available as an option package on lesser trim levels. The suite includes adaptive cruise control (ACC), lane-keep assist (LKAS) and automatic emergency braking (AEB) with pedestrian detection. ACC in the RAV4 is rubbish, but it's not exclusively a Toyota problem. The RAV4's ACC system only operates at speeds above 19 miles per hour (mph), which makes it useless in treacherous stop and go traffic – one of the main reasons you'd want ACC. However, the only compact SUVs with stop and go capabilities are the Jeep Cherokee, Subaru XV CrossTrek and Forester, which has tradeoffs in other areas, like the lack of a good hybrid powertrain. Toyota's LKAS system is able to keep the RAV4 Hybrid in the lane at speeds above 32 mph. It's not something I'd rely on for semi-autonomous capabilities, like Mercedes Drive Pilot in the new E300, but good enough for devouring a 4x4 from In-N-Out while road tripping – just skip the Animal Style and you'll be fine. I was unable to test out the full capabilities of the AEB system in the RAV4; it'd be irresponsible of me to purposefully trigger the automatic braking system. That and I couldn't find a friend willing to jump in front of the car and test its capability because they weren't "adventurous" enough. Toyota lets you adjust the sensitivity settings via the vehicle settings. I set it to high sensitivity and listened to the beeps and warnings when the car in front of me slammed on its brakes, which enabled me to hit the brake pedal before the AEB had to intervene. Regardless, AEB is a feature I assume works as advertised. Blind-spot monitor (BSM) with rear cross-traffic alert is standard, too, but is separate from the Toyota Safety Sense P suite. The RAV4 Hybrid's powertrain is the best thing about the car. It gives the vehicle a needed power boost from the regular RAV4 and the sweet, rear-biased driving sensation. The sport driving mode makes driving the hybrid entertaining – just swap the energy saver tires for stickier rubber. Toyota's lack of support for Android Auto and Apple CarPlay is a sore sticking point for me. There is absolutely no reason for a mainstream automaker to not get on the Android Auto and Apple CarPlay bandwagon, which lets owners use what they choose. Instead, Toyota seems to want its buyers to be stuck with Entune forever, pay for map updates and use its companion application for simple features, like internet radio. I'm sorry, Toyota, but the days of requiring companion apps for basic features was so five years ago – get with the times already. Inside, the RAV4 Hybrid reminds me of a mid-2000's American car prior to the bankruptcies, albeit with better fit and finish. The gratuitous use of hard plastics with a dash of SoftEx trim to have some sort of soft touch surface pales in comparison to its competitors that have soft-touch dashboards. There's no reason a car with a price tag above $30,000 should have an interior this cheap. Competition is tough in the compact CUV category. The Mazda CX-5 has much better interior quality and sporty driving dynamics but lacks the fuel economy of the RAV4 Hybrid. Honda's CRV has comparable driver assists and interior quality, but the powertrain is a snooze to drive. I like the looks of the Nissan Rogue, but the CVT is just as dreadful to drive as the Honda CRV. The Hyundai Tucson and Kia Sportage offer superior interior materials with Android Auto and Apple CarPlay compatibility in a sharp package, but lack ACC like the RAV4. That leaves us with the Subaru XV CrossTrek, Forester and Jeep Cherokee and their full-speed ACC systems, which are good cars but lack Android Auto and Apple CarPlay and aren't the most fuel efficient either. Subaru offers the XV CrossTrek with a hybrid powertrain, but it doesn't seamlessly combine the electric and gasoline motors as well as Toyota's much more refined system. Jeep's Cherokee has better off-road chops with the TrailHawk trim level, but the 9-speed automatic transmission has been problematic for every automaker. It's not a smooth shifting transmission and received countless calibration tweaks that made it better, but I'm still not a fan. Lastly, we have the new 2017 Ford Escape, a car superior to the Toyota RAV4 Hybrid Limited in every way, except the powertrain. The Escape's SYNC3 infotainment system supports Android Auto and Apple CarPlay, it's fun to drive and sports stylish looks and higher quality interior materials and driver assists that match the RAV4 Hybrid. The only advantage Toyota has over its competition is the excellent hybrid powertrain – and nothing else. Toyota's RAV4 Hybrid Limited is a stylish car with an excellent powertrain, but not much else. If city fuel economy is your primary concern for buying a car, the RAV4 Hybrid is your best bet. However, I would give up some fuel economy and go with the 2017 Ford Escape and its 1.5-liter turbo motor instead, which is superior inside and out.